With all this talk about Induction Hearing Loops and how they dramatically improve hearing and understanding in venues that are typically difficult for the hearing aid wearers, the one question that is asked over and over is “do you have a t-coil?” It is a simple question that many hearing aid wearers do not know the answer to! So what is this important t-coil? 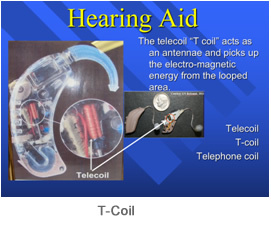 A t-coil, or telecoil, is a small copper coil in a hearing aid that functions as a wireless antenna that links to a sound system or PA system, delivering customized sound to the hearing aid wearer. It is an option on most hearing aids and is generally in all cochlear implant processors. Originally used to hear better on the telephone, the t-coil is necessary to hear within a loop system. Just increasing the volume on a hearing aid or cochlear implant doesn’t necessarily improve the clarity. That is the “wow” factor of a t-coil in a hearing loop system. The clarity and understanding is unequaled when listening in a loop. With a t-coil installed in the hearing aid, the user simply pushes the button or switch for the “T” setting – no additional headsets or receivers are necessary to hear clearly in the induction loop or on the telephone. Get yours activated! T coils must be activated by the caregiver or audiologist. Ask for it, it’s your hearing. Don’t pay until you get a working T coil and maybe a little microphone gain added in. Be sure to ask for a MANUAL T-coil when buying hearing aids. This will allow you to switch from t-coil to microphone settings as necessary. The audiologist should program the t-coil to suit the user’s needs which may include partial microphone on the t-setting, at least in one ear, to allow one to hear voices outside of the sound system. Most hearing aids can be equipped with a t-coil except for the very small ITC (in the canal) aids. If a hearing aid does not have a t-coil, most can be retrofitted for $100-300. Some hearing aids have t-coils installed but not activated and some need to have the t-coil volume adjusted. The t-coil opens doors to other options such as Residential loops work well for hearing the TV without bothering other family members or neighbors. Bottom line, ask for a manual t-coil and have the audiologist educate you on its uses. T-coils require adjustment as much as other settings on hearing aids so don’t be shy to ask for further assistance.